Worldwide, according to the EPA, as many as one trillion plastic bags are used each year and less than a mere five percent of that plastic ends up being recycled. This is a huge problem in polluting our environment and our oceans. Overall, our goal is to promote and create a cleaner environment, while allowing the brands we work with to create fully customizable bags that represent their brand in a unique and creative way. 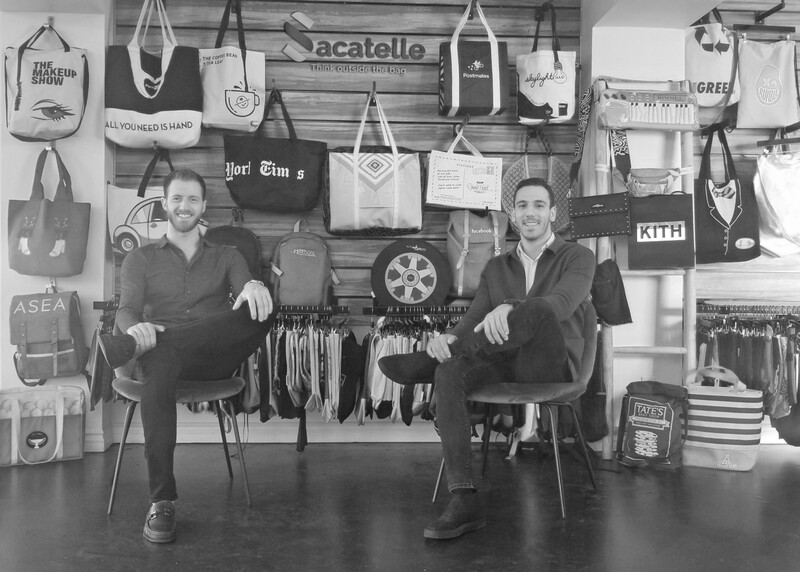 I had the pleasure to interview Ikey BenSimhon the Co-Founder of Sacatelle. I was working at an investment banking firm on Wall Street for three years after college, and quickly realized that the career path I chose simply wasn’t for me. The financial industry wasn’t fulfilling and didn’t allow me to exercise my creative side. After making the decision to switch industries, I focused on finding a new industry that I could shake up and set a new standard in. After much research I found that B2B branding companies weren’t catering to these sentiments. Many companies were creating final products that were not fully custom; they simply slapped logos onto different types of products and bags without much of a creative process. Brands who want their ethos embodied within the product they are creating need to have everything tailored to their own specific standards, and this is what I knew I could be capable of. “We made a dog bag for the American Kennel Club. This was a very complex bag, because each unit was to potentially have live animals carried inside. It was of the utmost importance to make sure that Sacatelle created a safe product, ensuring adequate weight distribution and comfortability for the dog –ultimately, so no one could sue the AKC brand. The research and development for this product alone took over a year. A big problem we faced was the accidental contamination of lead in our bags. The first couple tries ended up not working and our bag ended up failing the lead test. We are always extremely particular in the materials we choose, so I knew there was no possible way our factories and materials were the culprit of the lead, so I personally pushed for further testing to confirm my suspicions. Overall, this process cost Sacatelle a heavy sum of money. We ended up shelling out for expensive testing ourselves, so we were able to break down the bag and see all of the molecules involved in the materials. In the end we discovered that the lead was coming from inside of the lining — the cloth tag with the wash instructions — the only part of the product which we did not produce in-house. Can you tell us a story about a person who was impacted this cause? 1) Politicians and community officials can officially address that climate change is real, and humans are having a negative impact on our environment with our massive amounts of waste. 2) They can also address that the ban of plastic bags will have a real impact on society, as consumers who are shopping at their local grocery store can take an average of 10–15 plastic bags home with them every time they shop (multiplied by the amount of shops they do per month, then per year). Making sure to take away this carbon footprint that does not decompose very well is essential for keep our oceans clean. Since the state of California banned single use plastic bags, you can see a difference in the impact of CO2 production in LA (The manufacture of one pound of PET plastic can produce up to three pounds of carbon dioxide). 1) Persistence is Key –Perhaps developing a customized reusable bag is not on a company’s radar now, but after making an initial connection with a potential client, make sure to be persistent. Not only will it land a sale in the future, but it will also show that you have been following the brand and have taken notice to what the company has been doing. 2) Be Resilient — When you fall down, get back up. Not everything will work out the first time around, so you must try and try again. The end result will be worth it, as well as the lasting client relationships due to your hard work. 3) Create an Open Line of Communication with clients and staff — This is essential for a CEO or entrepreneur. Creating an environment where your clients and staff can be open and honest with you will not only create a positive work environment but will put potential issues on your radar before they happen. 4) Make an Impact — Whether it’s at a networking event, a dinner with colleagues, or a business meeting with existing clients, it is important to show that you are invested into the current project or conversation to make lasting personal connections that will resonate with others. This will make your interaction stand out from the rest. 5) Go with Your Gut- If something doesn’t feel right to pursue, it probably isn’t. As we have learned with our experience with the American Kennel Club bag, getting to the root of the issue not only helped clear my conscience that a good product would be going out to their consumers, but it gave us a lesson for the future on wash cloth tags in the industry as a whole. “I would love to sit down with Scooter Braun and discuss his business strategies (and hopefully make bags for his companies). Coming from a similar background as myself, his motivation and determination to be successful really resonates with Isaac and I, and we look to execute similar goals and initiatives into our company. The way that Scooter believed in Justin Bieber’s career through his ups and downs is something that pushes you to follow your own vision and dreams.